Southbank's premier food & wine festival, Regional Flavours, returns on July 15-16. It wouldn't be an over exaggeration to say this festival is one of the most highly anticipated events in any self-proclaimed foodie's calendar. This year's program is chock-full of deliciousness... There's live cooking demos, masterchefs, gourmet food stalls, wine tastings, food trucks and so much more happening over the course of the two days. A few weekends ago we went on a "Gourmet Adventure" with Brisbane Marketing to get a taste at what you can this year's festival. So without further ado, let's dive into our trip! To kick off our Regional Flavours experience we headed along to Sunday Sessions at River Quay Green. 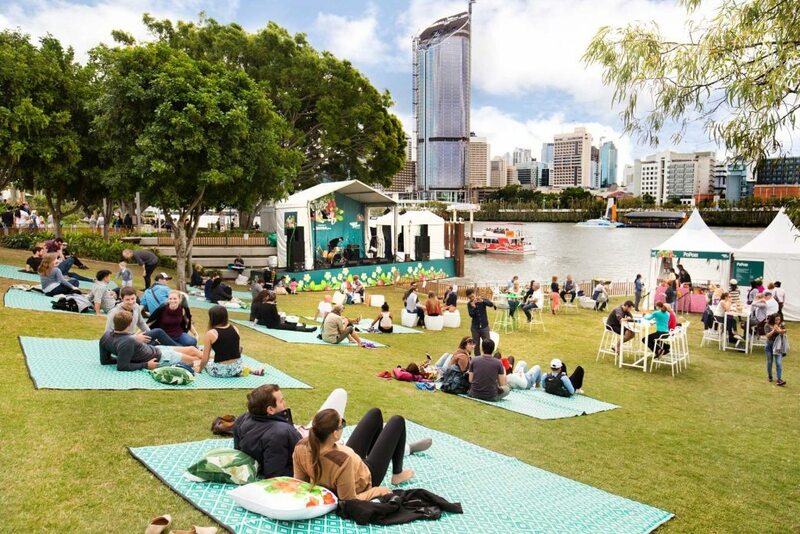 Located on the edge of the Brisbane River, River Quay Green is an award-winning dining and green space. Boasting stunning, uninterrupted river views and a plethora of quality restaurants at your fingertips, it really is the perfect weekend chill spot! This is the area you'll find the River Quay restaurant food stalls at this year's Regional Flavours. We got to sample the "Queensland Produce" menus that will be available exclusively at the festival. Trust me, you are going to want to save room for this! Some of our highlights from the menu are Spiced fish n chips from River Quay Fish & King prawn tacos with kale and avo from Stokehouse. For more info on what's on at River Quay during the festival, click here. Next, we loaded up the bus and journeyed only about an hour out of Brisbane to the beautiful Lockyer Valley. If you've been to Regional Flavours over the last few years you know the Lockyer Valley sections is one of the best! We are happy to report the region will be represented once again this year. So gather your mates and grab a spot at their lovely picnic patch surrounded by fresh veggies, while celebrity chefs cook up delicious treats using the fresh Lockyer Valley produce. On our visit to the Lockyer Valley, we were treated to a farm tour at 9dorf. 9dorf is a family owned farm that has been operating since 1918. They are very passional about sustainable farming and ethically raised animals. The public is welcome to see how they operate and walk with the animals by booking a farm tour via their website, available here. Their property is so picturesque, with beautiful mountain views and big, blue skies. We highly recommend a visit. Be sure to head to their stall at Regional Flavours for more info and to sample their scrumptious produce. After a big day on the farm, what's better than a relaxing long lunch at Wild Canary? That's exactly what we did! Wild Canary Bistro in Brookfield is helmed by Executive Chef Glen Barratt. Glen has long been a supporter of farmers markets and local produce. The colorful menu at Wild Canary changes weekly as fresh produce becomes available. The desserts are to die for! You can find Glen and his delicious creations on the Queensland Taste stage this July as well as in The Hunting Club sharing his secrets to a perfect brisket. Speaking of The Hunting Club... the bar & pop-up bistro will be operated by The Charming Squire. If you are a fan of mouthwatering meats and flavour packed craft beers this your spot. As always you will find Brisbane's resident beer enthusiast, Good Beer Matt, talking all things hoppy. A few well-known chefs will also pop in sharing their tips & tricks. For more info on The Hunting Club, click here. Finally, we wrapped up our gourmet adventure with a seafood cooking class/lunch with none other than Paul West at The Oyster Shed (Sandstone Point Hotel). Yes, the lovable celebrity chef will be back cooking his heart out on stage at this year's Regional Flavours. Paul is an advocate of the Moreton Bay region and a sustainable seafood expert! So fittingly, he will be cooking up a sizzling seafood feast on the main stage, Saturday July 15. More info on Paul and all the wonderful celebrity chefs cooking at this year's festival is available here. With SO MANY delicious things happening each day the FOMO is intense. So why not treat yourself to a staycation in the city so you can be close to the action! Brisbane Marriot has some enticing foodie-friendly packages on offer. They are only a quick 5 minute uber away from South Bank! For more info on all things Regional Flavours, be sure to visit the official website and plan your visit, available here. *AmeriAus was the guest of Brisbane Marketing and South Bank Corporation.